Canada's top finisher was Leandre Bouchard in 26th place. Bouchard moved up steadily through the race from the 40s on the opening lap. 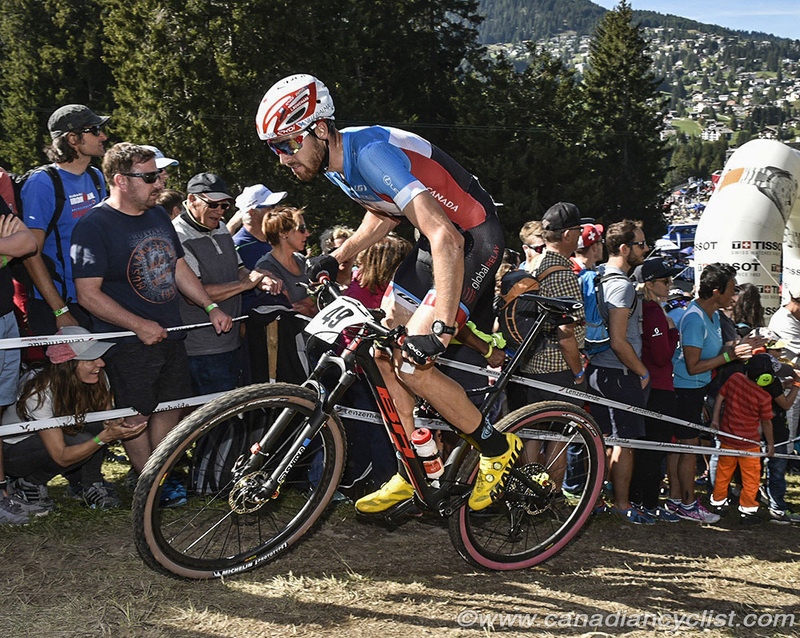 Other Canadian results were Raphael Gagne in 48th, national champion Peter Disera in 49th, and Andrew L'Esperance in 60th. "Pretty happy to finish my season on a high with my best performance of the year," said Bouchard. "I had ups and downs this year, so to prove to myself that I was capable of such a performance is really nice. Also, I'm happy about how I rode; I was smooth and calm when I was riding in a group and I was able to move up on the big climb and to do strategic passing." 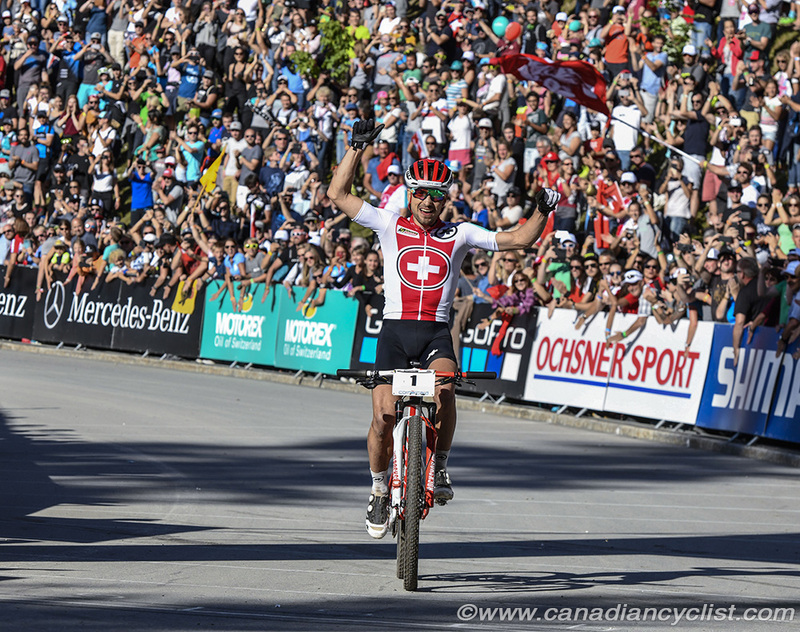 Nino Schurter came into the Elite men's race with six world titles already, but this was a chance to win before a home crowd, and he did not disappoint. The Swiss rider, who lives only 20 minutes away from Lenzerheide, attacked on the opening lap, and only Gerhard Kerschbaumer of Italy was able to go with him. The pair rode together at the front for the entire race, until Schurter attacked with a lap and half to go. 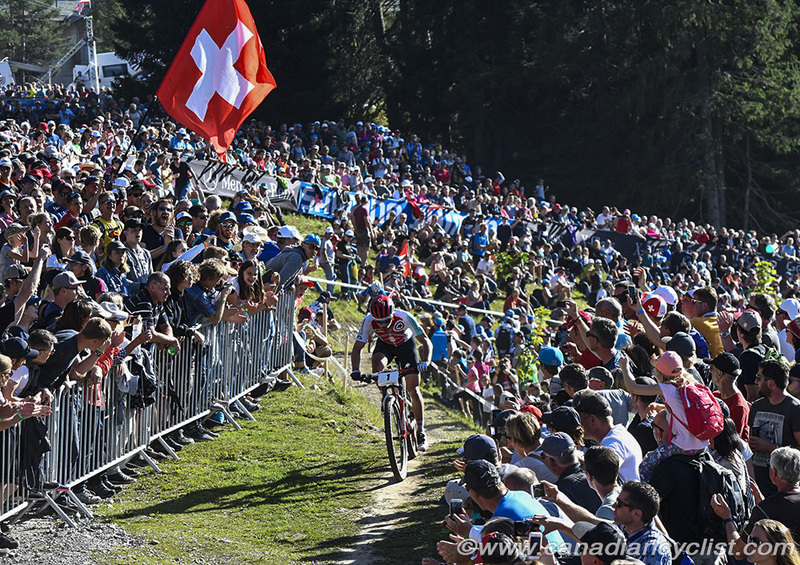 At the start of the final lap, his lead was a slim six seconds, but Schurter continued to push the pace and Kerschbaumer could not respond, finishing 11 seconds back as Schurter rolled across the finish line to the cheers of thousands of Swiss fans. Mathieu van der Poel of the Netherlands came back from a slow start to move into third on the fourth lap, and held it to the finish line for the final podium spot. Peter Disera: "World Champs was awesome today but not for the reasons you'd think. Although I was caught in three crashes off the start and really had to fight from the back I was pleased to have good drive and fight to push my way into the top 50. Unfortunately, a mid-race flat would see me in the pits and slip outside of the top 50 until a late race charge landed me 49th on the day. Why was it awesome? The course, spectators and an unwavering drive and mental determination. It was a good day for me, regardless of result." Raphael Gagne: "So I finished 48th. Considering I started 70th, and had absolutely no luck in the start losing positions in the first staightaway and first corner, lots of bumping into each other or missed pedals, that put me around 80th or so after one minute. I think I did a strong race to come from behind and finish 48th." "I knew traffic was going to be an issue since the gaps open up very fast when you are in traffic, so I invested a lot of effort in the first 2-3 laps, actually too much effort, and then paid for it later in the race. All in all, I am happy with my fight from start to finish and I am finishing the season motivated and healthy." "Looking back at the early season in March and April, I lost a big [UCI] point opportunity when we could not finish Cape Epic (my teammate got sick), and then that massive bloc of racing got the better of me and I got severely sick in April. That caused me to miss the US Cups, and that put me in a tough spot for traffic most of the season." "For that reason, I am taking actions to race a bit more at the end of September and early October in Israel to get more points, have fun traveling and get some racing experience as well." 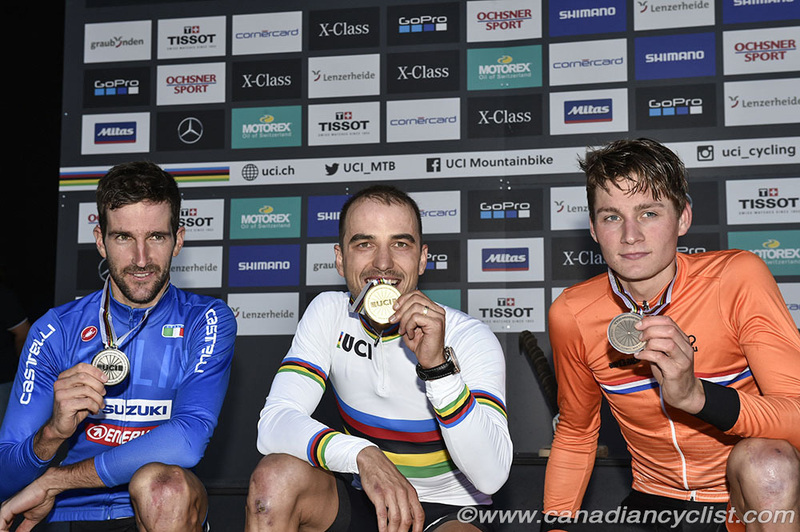 "I'd like to take this opportunity to thanks Cycling Canada for the amazing support at these world championships as always, and thank my Silverback OMX pro team for the support this season."